With a traditional style fit for your classic home office, this writing desk simplifies staying organized and getting work done. A drop-front center keyboard drawer has built-in cable management to prevent clutter while a file drawer helps to keep your important documents organized. The left hand drawers bring versatility to the piece with adjustable or removable dividers and pencil trays to ensure the desks storage abilities match your unique needs. 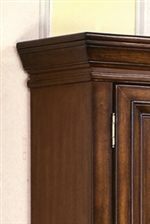 Traditional influences can be seen throughout the piece through the use of turned legs, traditional hardware, and recessed panel detailing all in a lovely Cherry finish. The Woodlands Traditional Writing Desk with Drop Front Keyboard Drawer by Flexsteel Wynwood Collection at AHFA in the area. Product availability may vary. Contact us for the most current availability on this product. 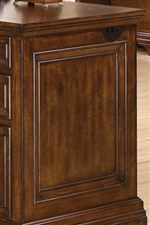 Case Construction Hardwood solids with rich high quality veneers. 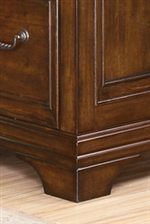 The Woodlands collection is a great option if you are looking for Traditional furniture in the area.